Rev. 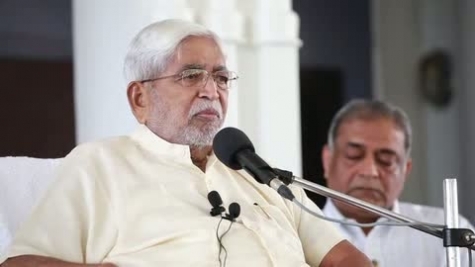 Master's message to abhyasis on the day of his 87th Birthday on 24th July 2013, Chennai, India. For me, every day that I awake is a reminder that, by His grace, I am getting one more day to fulfil my obligations to myself. It is a reminder to me that the universe is not worried about me, nor is God worried about me. The person who is worried about me and my progress is my Master. So each morning I wake up I give thanks to my Master, because, had I fulfilled my journey, I don't think I would need to wake up again one morning. It's not necessary. This life is given to us to fulfil our obligation to ourselves. We have come here with a purpose to fulfil, for ourselves. I have to come. I have been born to evolve into a situation or a condition or a state of being in which I can no more reside on earth. I cannot reside here again once my journey here is fulfilled, unless Nature sends me again to go and says, "Look after my children." So when such a person is sent back here and His divine command is "Go and look after my children," in a sense there is putramoha [attachment to one's child] in me. My putramoha starts with my children at home, but as my circle widens my putramoha will and must embrace everything everywhere – all life. So you see, putramoha is not a bad thing. It is bad only when like Dhritarashtra, only his children are enveloped in that small circle. But when the putramoha is all over the universe, only two people can be said to have that: the [hierarchy of] Masters and the Master. So don't be afraid, because unless you love your children truly in a sense of spiritual growth, spiritual awakening, and the love for them in which you are not only concerned with their material life but you are much more concerned with their spiritual life and progress, you are not worth the salt that you eat. I have repeated on so many occasions that our spiritual evolution is never only for ourselves. Your children must evolve with you. Your social circle must evolve with you. Are you contributing to the evolution of your friends, of your relatives, of those around you, or are you just wasting time smoking with them, drinking with them and criticising everything in this world? It is sad that there are some people who do nothing else but throw stones at everything that is good. It is a shameful fact that many of our abhyasis indulge in such nonsense, sending out nonsensical emails, vulgar emails criticising everything, when they should be looking into themselves and seeing what they are. I warn you that with such activities you are only digging your own grave. Nobody digs your grave or pushes the button on your spiritual elevator except yourself. The hand that can push the elevator button and take you up to Infinity is the same hand that can dig your grave. On this auspicious occasion I wish to remind you that you are the only karta [doer], you are the only builder of anything that you can build in this life. And what can you build in this life? Your spiritual future: which is resplendent, which is full of spiritual bliss, in the company of the hierarchy of the great Masters and the divine position where you are assured of proximity to them. And of course as Babuji Maharaj has written in so many of his messages – he says, "From there we shall go on to other adventures." He calls the spiritual life an adventure. It is an adventure. In an adventure you have fun, you have pleasure, you have danger. Here the danger of life is not from tigers and snakes and lions. The danger is from your own evil in your own heart which does not permit you to look at the good in others. Babuji Maharaj said, "Always look for the good in everything that you see. Don't look for bad. Bad anybody can find. Only those who are evolving can find the good in others." You know, there are people here who will look at a dosa and find a fly in it. They will cut a vadai and look; they will find an insect in it. Was it there before? I don't think so. Their own bitterness, their own ugliness in their heart, it creates badness where they look. Should such people exist? Well, I don't know, Nature gives them chance after chance, life after life: "Do it, my friend. Do it, my friend. You are Mine and I want you to come to your divine home." Do you want to be ever, through eternity, finding flies in dosas, insects in vadais, and evil in everything that you see? When are you going to learn to look at the good in others? When are you going to look and say, "Well, there is a jewel in his heart"? Of course, another friend will say, "What jewel? Yaar, it's only a small bit of …" You say, "Well, it's not in you. Look at him." You see crows fly through our hall. They don't see any danger here. Why? Because in our hearts we have nothing against crows, nothing against snakes, nothing against anything. If there is something happening to me, it's because it has to happen to me to awaken me to the fact that: "Dear Friend, I was waiting here for you to come." Why did you come? You came because you have created a future in yourself in which you had to have this agonising part of life too. Nothing comes to us except that which we invite because of our grossness, because of our samskaras, because of the evil in us that invites only evil. Like attracts like – l-i-k-e attracts l-i-k-e – remember. Therefore drunkards have drunkards as friends, thieves have thieves as friends. And evil always find their own company in which they are happy, in which they think they are getting rich. But the riches of today are gone tomorrow because of their evil habits, and then they have to do it again to get more money…. Evil needs wealth, riches, because it is thrown away. A good man doesn't need much money, if you follow the tenets of Sahaj Marg: be simple and in tune with nature. Simplicity starts with being clean, simple clothes, living in a simple room. After all, when you are living in a house, people come to see you and see how your heart invites them or rejects them. They are not interested in the pictures on the wall and the frumpery and trumpery that you put on display. It is you they come to see and if they don't see you but only see your riches and your gold and silver ornaments, will they go away happy? They will say, "Nahin [no]." "But what about the food served on golden plates, with mithaiwalas [sweet makers] you brought from Benares for cooking?" They will say, "Yaar, I didn't go for that. I didn't see a welcoming smile on his face. I didn't feel welcome, and when I wanted to eat, it became mud and ashes in my mouth. Do I go to eat his samosa and his kachori [snacks]? No. I think because, or I thought that because he was very rich he would welcome us, be generous. But the way he looked at me showed that he was not happy." Even though there was food for fifty people, he did not want them. Then why did he put this food on the table? Only those who are hypocrites like himself appreciate it, because they wink at each other and say, "As he is so am I, chalo [come on], let us eat." Again, like attracts like. So beware of like attracting like. Babuji Maharaj once told me, "In Sahaj Marg there is no friendship." Friends are those who destroy us. They introduce you to bad habits, not because they are evil but because you attract with your evil in your heart those who will put you on the path which you have chosen. Remember what Babuji Maharaj has said: Nature supports you in any activity that you choose for yourself. You choose to be a smuggler, people who will help you in that will come to you. Whether they are also smugglers or suppliers of goods or civil officials, you will find assistance, because that is nature. Nature helps – full stop. It doesn't say, "Who?" It is like the power of a motor or an engine. You yoke it and it runs. It's like a horse-driven carriage. It goes where you want it to go, not where it wants to go. All power, all nature helps. And as the proverb ‘…helps those who help themselves' means, if I am helping myself, then I choose in this universe of universal possibilities things that will advance my evolution and reject everything else that does not contribute to my evolution. It's not a question of good and bad. Remember what Shakespeare said, "Nothing is good or bad but thinking makes it so." If you think it is bad because your mind says it is bad – and your mind says it is bad because your evolution does not need it – but you still accept it, it's your fault, not His fault. Therefore choose wisely. To get that wisdom you must be afraid of the power of choice. If there was no power of choice, there would be no problem at all. A bullock in a cart has no problem. It has no choice – it goes where its master wants it to go. Now were we like that, yoked to the Master in such a way that we can go only where he wants us to go, there is no problem at all. Where he goes I go. But to be able to say that or even to think it for yourself, you must be so firmly yoked to him that there is no other way. But if you say, like many intellectuals do: "What is the use if I cannot have the freedom of choice? "… The freedom of choice is the most dangerous thing for us, because unless you have the wisdom to choose, it helps you to condemn yourself to all the bad things. "No, no, I am free." Why do you say it? "Oh, because I have the freedom of choice. I live in a free society. I can do what I like." Yes, you can do what you like, but does it contribute to your spiritual evolution? "Who bothers about spiritual evolution? I will take it up when I am forty, when I am sixty." Do you know you will live till you are forty? Who knows? Are we not seeing every day newborn babies die – children of five, six, seven, go through the ages, and they are dying everyday? There is no guarantee of how long you are going to live. You run after money. There is an offer which expires at noon tomorrow. Where? In some place. Don't you run? Take the fastest possibility of getting there, put your money – all because there is a promise. In Sahaj Marg there is no promise, but there are guarantees. What is the guarantee? Follow and you will be there. "What have I to do?" Follow. "Whom?" He who is there – your Master. "Follow in what sense?" Obedience. If he says sit – sit. If he says meditate – meditate. If he says, "Today you are too tired, sleep," you sleep. You don't argue. You don't say, "Master, I don't need sleep." He knows. Obedience, discipline – two things. Obedience means discipline, discipline means obedience. I don't know of any third factor which can influence my spiritual life. So you see, if you are not obedient and you say, "I am disciplined. Whenever the bell rings at five o'clock in the morning, I see people getting up. Am I not disciplined? I am awake to see them get up." But are you getting up? "No, I wait until they finish." Generosity – aha! What a wonderful thing. You wait till they are finished. "Yes, Master, my nature is like that." What about the breakfast? "Oh, I am there first, when the bell rings." Why? "Because I must have my breakfast before everything is finished." This is not discipline. It is selfishness. You are utterly selfish. You are too lazy to get up and you pretend that you give the others a chance before you to go to the bathroom. Isn't it? Your discipline is only to look after yourself in the only way you think you should look after yourself – not in the way that the Master says to look after yourself. What does Master mean when he says look after yourself? They are there in the ten maxims of Sahaj Marg. How many of our abhyasis can recite all the ten maxims even today, after thirty years, twenty years, fifteen years as abhyasis? "No, no, sir, the first one is very difficult." What is the first one? It says, "You wake up early." The second one? "Sir, when I cannot do the first one, what is the use of remembering the second one?" Isn't it? So when we cannot do the first one, we stop. We don't try to do the first one. We never try to get up. "Arise before dawn." We don't. If we have an alarm, we don't hear it. If you hear it, you put a pillow over it and shut it up. Sunday satsangh? "Sir, it is the only holiday we have. I am trying, sir. I attend Sunday satsangh a few times in a year." How many times? Ten? "Maybe six or seven." Maybe? Surely, how many? "Surely, sir, at least two or three. Because my wife won't… she bothers me. She troubles me always. Because of her at least two or three I attend." Satsangh! Babuji Maharaj has said: only those who attend satsangh are in my vision; I see before me, like a television screen in which I can see all those who are regular for satsangh. "No, no, sir, my Master sees everywhere, everything. Will he not see me?" But Babuji himself has said this! No discipline. All right, how often do you meditate at home? "Sir, I have children. I am unable to accept the first maxim. I am late. I am always late to go to work. My children bother me, my wife troubles me." Gayaa [He is gone]! So, are you committed to yourself? Sahaj Marg does not demand a commitment to your Master, to the system, to attendance – nothing. It says commit yourself to yourself. If you are truly self-interested, the first thing you will do is to attend to your spiritual life. You will get up – not at four, at three – get ready, take a bath and meditate so that you are fresh even before your children wake up. You have finished your morning commitment. So you go like a free bird singing at dawn. You go into work, you are ready, you are early, you are fresh. Your work shows a sign of evolution because evolution is a total concept. You cannot evolve spiritually and be shoddy in your material life, because the sense of commitment is pervasive. When I am committed to myself, I am committed to my work. If I am committed to my work, it is resplendent, it shines whatever you are, whether you are a carpenter or a shoemaker or a governor. No humbug, no cheating. Without this commitment to yourself you are nothing in any field. With this commitment to yourself, you can become everything in every field, which is what divinity is supposed to be. God is not committed to anything. Lord Krishna says in the Gita, "I have no duty to perform, nor does the effect of anything that I do reflect on myself." I have no duties; my performance does not leave anything on me – no grossness. That is the divine field of activity in which you do and you do not do, or you do nothing but you are doing everything. You seem to be asleep but inside you are awake – yoganidra, that is what it is called. You love and they can perceive, but it is not something to be seen by kissing on both cheeks and "Good morning, good evening, good night" – all this politeness, this mockery of courtesy – something in your heart, something in your hand, something on your face, like the smiles of public hostesses. Beware of not being yourself inside as you are outside. I am not saying to beware of being something inside which you are not outside. No! Beware of being something outside which you are not inside. Beware of being polite when you are not having polite thoughts in your heart. Beware of appearing friendly when you have enmity in your heart. It is good to be anything if you are inside and outside the same. Try not to be a thief, a deceiver to yourself, because surely you begin to think that what you are outside, you are also inside. Corruption – increasing corruption. "No, no, sir, I am a good man. I have never done harm to anybody." Yes, but what about the millions of people you have harmed? "Those are policies. What can I do?" These are the most dangerous: people who think they are good, who think they are always good, and are telling us to be good. Be simple and in tune with nature. You must be the same inside as you pretend to be outside. Or, to put it in a more spiritual way, your inside and your outside must be perfectly the same. We must not pretend. ‘Pretend' means I am showing outside something which I am not inside myself. Avoid that hypocrisy, totally negate it. Don't be afraid of showing your true self. Because after all that is what you are. Then somebody can help you. Otherwise, nobody will help you. You are like the man who goes to the doctor and says, "How are you, doctor?" "No, no, how are you, my friend?" "Oh, I have nothing. I only came to wish you...". Something inside pushed him to go to the doctor, but coming there he is not able to show his inside – only his polite outside. He goes back as he came. And perhaps in the next day's obituary column in the newspaper you will find his name. Death awaits those whose hypocrisy denies help to them. Remember that. Be simple, be simple – very simple to say it. Are you simple in word, in thought, in action? Sahaj Marg is simple but it requires courage to be simple. It requires courage to be able to say what you have in your heart. The most important three words in life, ‘I love you', the people who say it don't mean it and the people who mean it are too shy to say it, because as Babuji Maharaj wrote to me in one letter: "I love you, but this must not be repeated." Understand? It is like a fire that we light. In India this system that when the bride comes, newly-wed, she brings the fire, or he takes the fire to their home and that fire is never dampened. It's kept low at night by ashes. In the morning, they blow, light it, they put more firewood on it. At nights they dunk it with ashes throughout their life. And at the end of life, when the body has to be sent back to nature as components, the same fire is taken and used for the end-of-life ceremony – one fire throughout life. That is our old custom. We are what we are and it is not like the braggadocio of humbug, which says, "I am what I am. I don't care who sees it." It is the humbleness of those who know that whatever they are… good, but it's not enough. They have to move on, and to move on, here is the path, here is the Master. If you follow him, you will go to your destination. I pray for all of you. Thank you. I am not ashamed to tell you this, though I suspect some of you, a very few of you, know it – that without you all I feel lonely. Even before the utsav [celebration] starts, I am thinking: "Yes, they are coming for a few days, and then they will all leave me." And I feel very lonely, I feel very sad. So you can judge the amount of sorrow that accumulates in my life. Of course I know some of you will say, "If you want I will stay with you." Not a question of my wanting. If I have to call people to be with me, that is not true affection, true love. So, to dispel my loneliness, to help me get rid of it, I need companions on my spiritual way whose presence I can feel always, whether they are there or not. So remember this. It's no use saying, "Sir, I want to be with you always, but…" This ‘but' is a terrible thing in every language. "I want to help you, but…" "I want to go for satsangh, but…" So they add ‘but', ‘but', ‘but', and get butter! So remember, the life of spirituality is a life of loneliness, because as you evolve, you find fewer and fewer companions on the way. So when I started this talk, I told you in Sahaj Marg there is no friendship. What can friends do for you? Spend ten minutes with you? You want eternal companions. So look for them in your spiritual life.